^ Bureau, US Census. "State Centers of Population 1880-2010: Tennessee". www.census.gov. Retrieved 2019-04-11. ^ Pittard, Mabel (1984). "Appendix B: Mayors of Murfreesboro". In Corlew III, Robert E. Rutherford County. 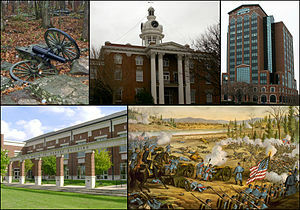 Tennessee County History Series. Memphis State University Press. pp. 132–133. ISBN 0-87870-182-6. OCLC 6820526 – via Internet Archive.